Learn how to trust again in relationships and rebuild trust after a marital affair. Marriage after an affair can be stressful, learning how to trust following infidelity can leave you asking, "How can I learn to trust in my marriage with such a betrayal?" Survive an affair marriage after trust rebuilding and learn to trust people. Learn to trust yourself and forgive others when trust has been betrayed. In Trust Betrayal: Dealing with breach of trust, healing and learn to trust again, author David M. Masters explores the many types of betrayals that can take place in one’s life, how the pain from these experiences can block the suffering victims from untold peace, love and prosperity, how to promote healing and re-engage good fortune and how to live a happier, more productive and better life. No stranger to the emotional pain of betrayal, Masters helps the reader discover how the relationship enabled the transgressor to conduct the breach of trust in the first place. Though thorough self-examination, documentation and analysis, helps the victim regain control of their life. The emotional pain from failed relationships can cause the injured party’s life to implode, giving way to depression and stagnation. By using the techniques provided in Trust Betrayal: Dealing with breach of trust, healing and learn to trust again, the author coaches readers through effective visualization exercises and rituals that will assist victims of betrayal to not only get back on track, but to excel in a positive future with renewed spiritual energy and awakening. Covering a wide-range of possible betrayal of trust, no stone is left unturned, and these strategies can be applied to any type of emotional assault that has resulted in broken trust; anything from broken contracts to failed marriages. Transgressions are turned into episodic growth spurts, leading to a general understanding of the human condition, while bolstering self-growth. The catastrophic breach of trust, once thought of as a major negative experience, can be translated into an empowering time of spiritual growth that can catapult the afflicted into a new life of love, happiness, generosity, forgiveness and renewed faith in endless possibilities. 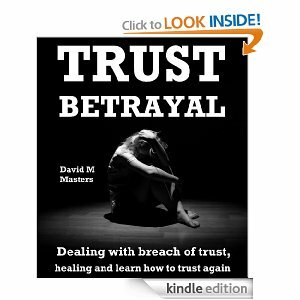 If you’ve suffered a betrayal at the hands of another, you can reclaim your life, and enjoy the best this life has to offer by following the guidelines set forth in Trust Betrayal: Dealing with breach of trust, healing and learn to trust again, by David M. Masters. Sicko.. let’s publish the records on file in Gray’s Harbor and wonder why Shelley still considers YOU the real Betrayal. Ya, you posed as a human but we know what you really are. Maggot.